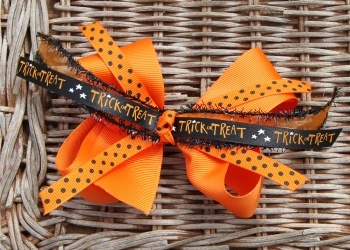 This Halloween Bow has a bottom layer of a 1.5" orange grosgrain bow. Covered with layers of an orange with black polka dots and a satin black ribbon with the words Trick or Treat. There is a black fringe layer running beneath and the polka dots wrap this up into one great Halloween treat. This is the perfect bow for all your Fall and Halloween festivals.